Everything you need to start dyeing vegetable yarns or fabrics made from cotton, linen, viscose, hemp and silk. This Procion Starter Dye Kit includes everything to get you started on the exciting journey that is dyeing. Procion dyes are cold water dyes and are just what you need to dye vegetable or plant based yarns, fibres and fabrics. The kit contains full instructions, 10g each of 6 full intermixable MX procion dyes, 300g fixer, urea, thickener, salt, pipettes, a sponge brush and disposable gloves. 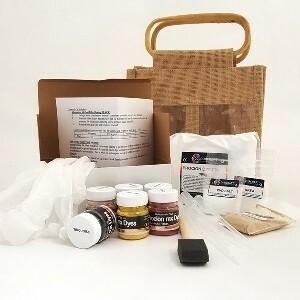 Presented in a cute rustic jute bag to create a lovely gift for a budding beginner dyer. Dye an incredible 1kg – 5kg of yarn or fabric depending on the strength of colour you require. You can also apply the dyes in a variety of ways to fabric by thickening the dyes and using the sponge brush applicator. A kitchen, buckets or pans, lots of space and time and some undyed yarns!